Orang Yang Berasal Dari Klang Harus Mengundi Di Ulu Langat? 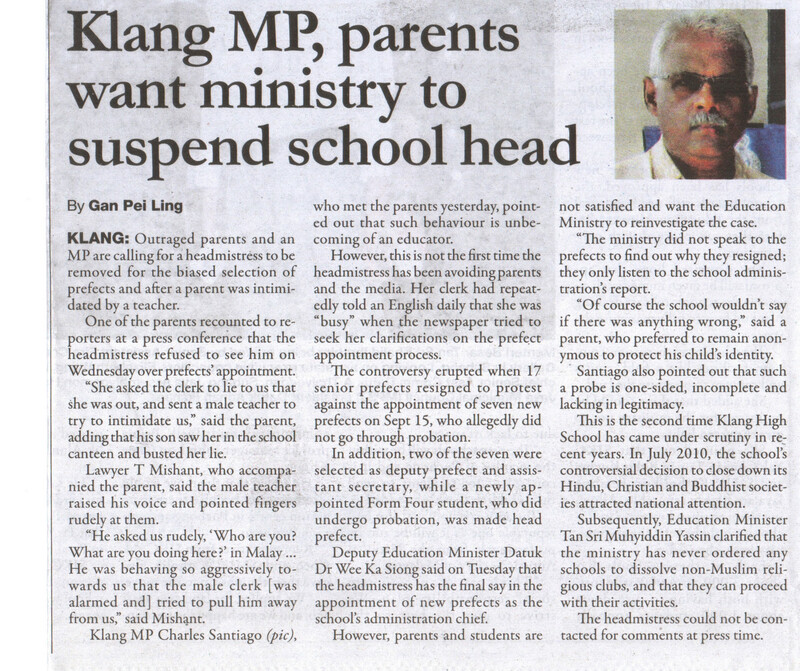 ” The parents of 17 students from Klang High School who had resigned as prefects”. 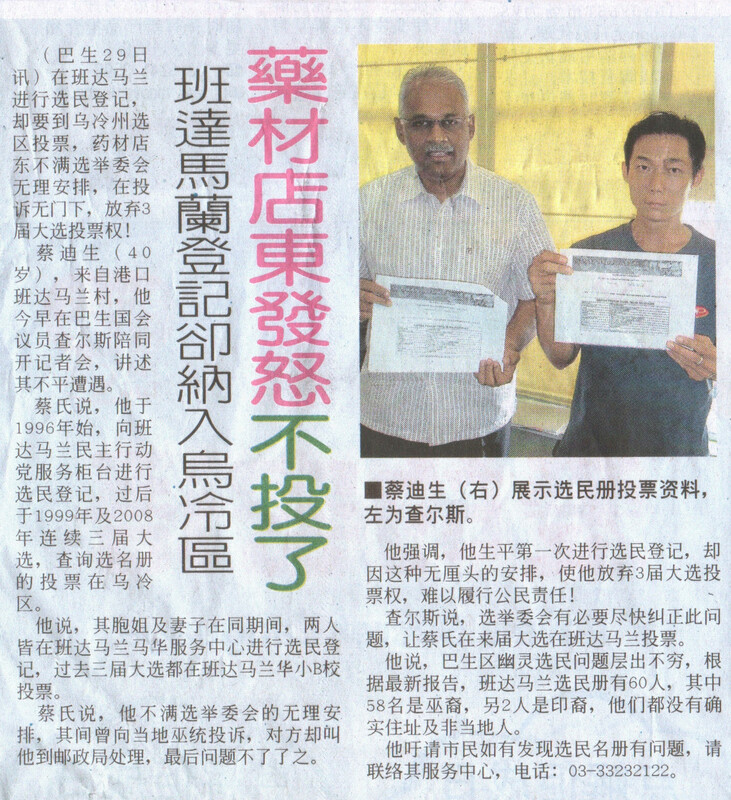 PETALING JAYA, Oct 1 — The proposed changes to labour laws, which trade unions say would promote outsourcing, are "illegal" as middlemen who subcontract work cannot be considered employers, Klang MP Charles Santiago has said. He said that an employer must be, by definition, the owner and operator of a factory and that an employment contract is only valid if entered into with someone who wields control over tools and the workplace. "Outsourcing companies are not owner-operators of factories so they cannot become employers," he told Malaysian Trade Unions Congress (MTUC) members at Wisma TWU here today. Santiago pointed out that if outsourcing companies were allowed to be employers, workers would not be able to claim benefits from the principal company and would have to pay out of their own pockets for medical care and other benefits. "So you could be working for Company A but that Company A is no longer your employer because your employer, if this Bill goes through, will be Company S, which is the outsourcing company. "So if you are hurt at the workplace, who will be responsible?" he said to raucous cries of approval from the 300-odd MTUC members in attendance. He cited an example of a contract worker injured by a forklift at his place of work who paid RM4,000 to RM5,000 for treatment as the principal company had refused to acknowledge him as an employee. The amendments would also encourage recruitment through outsourcing, a "very dangerous trend" that would have huge implications for workers' rights, Santiago also stressed. He said that, contrary to the Human Resources Ministry's assurance that the amendments would bolster workers' rights, such changes would only erode existing rights and jeopardise their welfare. Santiago added that if the government was concerned over abuse by subcontractors, it should have mooted amendments to the Private Employment Agencies Act 1981, not the Employment Act 1955. 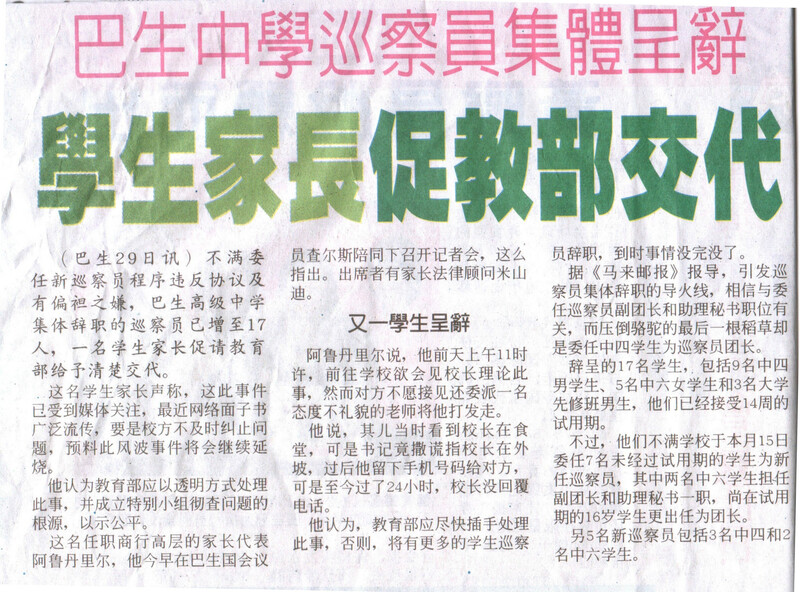 MTUC decided today to proceed with its plans to picket Parliament on Monday over proposed amendments to labour laws, despite an 11th-hour meeting with the Human Resources Ministry. The decision was made by MTUC council members after representatives from the umbrella body's 250 trade unions and the ministry failed to break the impasse over Putrajaya's plans to revise labour laws after the four-hour long forum. MTUC president Mohd Khalid Atan said he would mobilise at least 1,000 members to stage a protest against the proposed amendments, which are expected to be tabled when Parliament is in session beginning Monday. 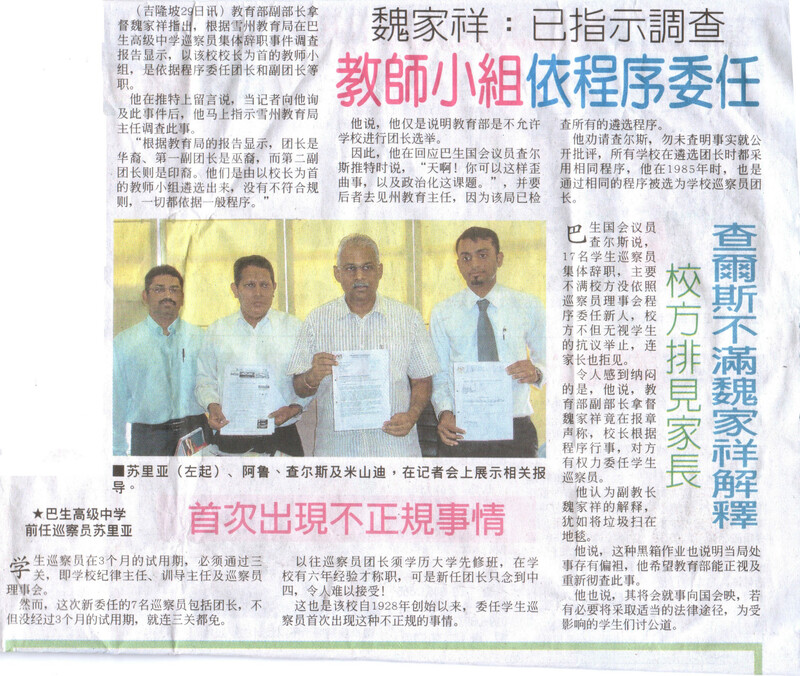 He added that MTUC had also agreed to write to the ministry soon asking for the Bill to be withdrawn completely. The Human Resources Ministry, led by Datuk Dr S. Subramaniam, previously said it had consulted workers' unions and employers' associations 18 times since early 2010 before coming up with the amendments. The ministry is set to present the Bill to amend the Employment Act 1955 for a second reading in the Dewan Rakyat. The second reading of the Employment (Amendment) Bill 2010 has been postponed twice previously. Last October, the ministry withdrew the Bill from the second reading to incorporate several changes and add further amendments but has refused to divulge further details. The Bill was first tabled on July 8 last year and touched on provisions involving sexual harassment in the workplace and the welfare of housekeepers. It is believed the laws scheduled to be amended include the Employment Act 1955, the Industrial Relations Act 1967 and the Trade Union Act 1959.